In 2012, RAIN, Wetlands International and JESE designed and started to implement an integrated project to address the challenges faced by the communities in the area traversed by the Rwambu wetland that forms the boundary between the districts of Kamwenge and Ibanda in Western Uganda. The project area is only approximately 25 square kilometers. The main challenges faced in Rwambu were: reduced soil fertility on the slopes, dropping water tables, poor sanitation, and wetland degradation. 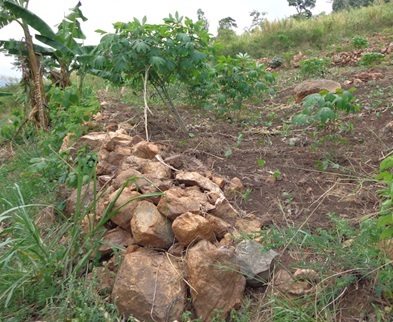 Hill slopes had been stripped of vegetation leading to increased soil erosion and consequently loss of fertile soils. The fertile soils eroded from the hill slopes were deposited in the wetland in the valley, and as soils on the hill slopes became increasingly less productive, the community started to open up crop farms in the wetland in the valley, often saying they were following their fertile soils. Springs and boreholes had dried up due to dropping water tables resulting from reduced infiltration of water into the ground –all the water would rush downhill. 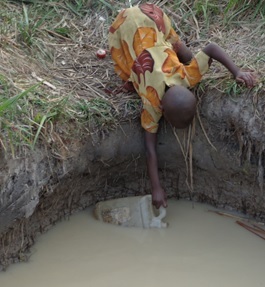 As such communities were forced to rely on open sources of water for water for home use. Acknowledging that these challenges are interconnected (i.e. one causing the other) and deciding to devise an integrated approach to address them was the “smart” choice RAIN, Wetlands International and JESE made. Business-as-usual would have been to look at the challenges as independent of each other and to have different organizations attempt to address different challenges (often at different times) according to their expertise and interest. The partners knew such an approach would be problematic. They instead zoned the project area according to location along the slope, determined which interventions best suit the different zones (uphill, mid-hill, downhill), and implemented the interventions simultaneously though not necessarily starting all the interventions at the same time –they called this the landscape approach. The project tested the integration of simple 3R measures (incl. stone bunds, check dams, soil bunds, percolation pits) and wetland restoration into WASH at landscape (or sub-catchment) level. Only three years and the results are remarkable. Soil erosion has been reduced and the soils on the slopes have started to produce food again, in some cases giving a 50% increase in crop yields. More community members have started to implement the different 3R measures in their gardens. The water table has been observed to rise, allowing for a sustained yield of boreholes and shallow wells in the project area compared to elsewhere in the same sub county. Farming in the wetland –though not yet fully eliminated- has reduced, allowing for regeneration of wetland vegetation. Due to improved water buffering on the hill slopes and also by the regenerated wetland vegetation, water flows in the stream have been observed to fluctuate much less between rainy and dry seasons. The project has become a celebrated example that the Uganda Ministry of Water and Environment (MWE) uses to demonstrate best practices in catchment based water resources management, and is mentioned several times in the Water and Environment Sector Performance Report 2014 produced by the MWE. In only seven months (July 2014 – February 2015), the small area of Rwambu was visited by close to 200 persons, including representatives from government agencies, local governments, Civil Society Organizations (CSOs), Private sector, Academic institutions, Media, Donors, and other communities outside of Rwambu. The partners have learned that other stakeholders including government are keen to adopt innovations and new models if evidence is provided that the innovations and new models work. Mr. Ngwenge Leon: Agency for Sustainable Rural Transformation (AFSRT), Northern Uganda. Mr. Simon Peter Sekuma: WASH program Officer for NETWAS –Uganda. Mrs. Pamela Kabasinguzi: Manager for the Health, Water and Sanitation (HEWASA) programme of Caritas Fort Portal, Western Uganda. RAIN and partners have demonstrated the efficacy of carefully planned integrated approaches, and have generated evidence and lessons on the basis of which the model of the project can be out-scaled. Currently RAIN and partners, as well as the MWE and other organisations are looking to implement projects in other parts of the country using the model demonstrated by the Rwambu Environmental Sustainability Pilot project. This year, RAIN, Wetlands International and JESE will collaborate with new partners; the Rotary club of Heemstede, the Netherlands, and the Rotary club of Iganga, Uganda, to start a similar project in another area (Rwebikwato village) in Kamwenge district. 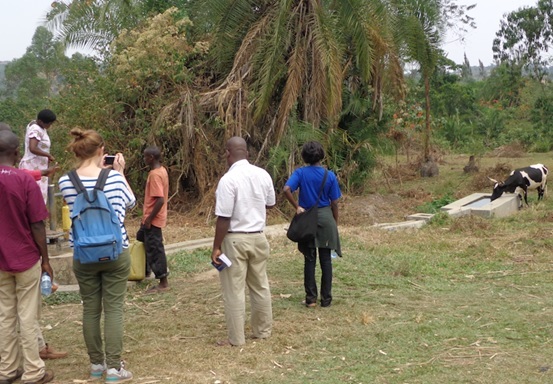 In February 2015 (12th – 20th), the partners conducted a design mission to Rwebikwato, in which issues similar to those observed in Rwambu in 2012 were encountered. 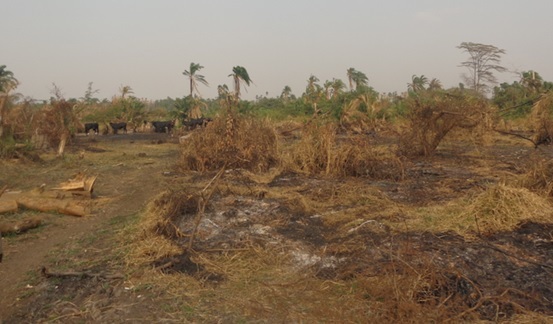 Communities rely mainly on open water sources some of which dry out during the dry season; soils are becoming increasingly less productive; and swathes of wetland vegetation including forests have been lost to charcoal production and animal grazing yet the wetlands are the watershed for Mpanga which an important river in the area. River Mpanga is the main source of piped water for the small urban centres in the region, and houses a hydropower-generating dam. The partners will intervene into this predicament by working with the community to restore the wetland, promote soil and water conservation through 3R measures, construct shallow wells and protected springs, and subsidize provision of domestic rainwater harvesting tanks. RAIN is a brand of Aidenvironment, setting up programs and projects focusing on rainwater harvesting and 3R techniques.